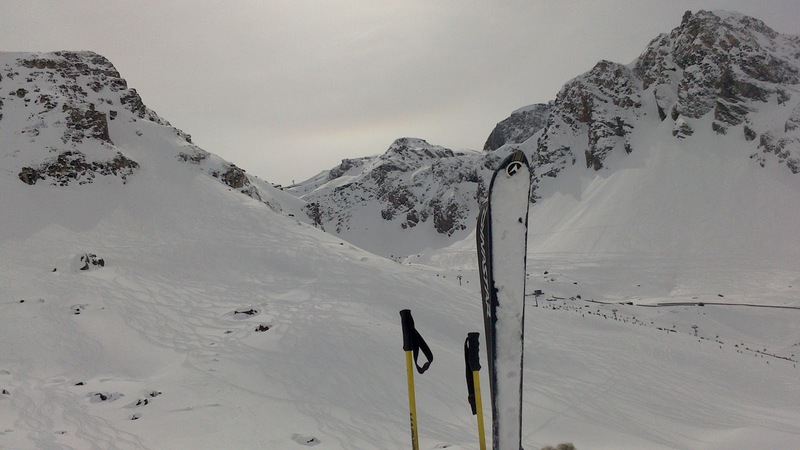 Ma Vie Parisienne: X-Games, French Alps Edition! This week I was able to cross yet another bucket-list activity off the list: snowboarding in the Alps! Allysan and I- atop the "Grande Motte" Glacier on the French/Italian border! We were 3200M up, and from here we could see Mont Blonc! Through the USA connection of my roommate and great friend, Allysan (above), (who's father worked for ESPN-) we were able to stay and enjoy the magical region along the French/Italian border. While Allysan worked for ESPN for the past week--learning a lot about the live-television production world-- I was able to experience some of my favorite days since being in Europe- and with out a doubt some of my favorite days out on slopes. Best seen through videos- you can check out the view from the slopes, as well as the HUGE super pipe/slopes course set up for ESPN's Winter X-games (extreme sports competition that Allysan worked/we enjoyed). Snowboarding by day/watching the events of some of the best skiers/snowboarders by night?! Not a bad way to spend the week! Watching the athletes every night gave me a whole new appreciation for extreme sports! The adrenaline was palpable! I love watching live-sports, especially these events, complete with an atmosphere of a music-festival! The crowds were singing, dancing, and encouraging the athletes along the sidelines. It felt SO GOOD to be back among mountains! It reminded me of my beautiful last summer out in Wyoming, except with exponentially more mountains than the peaks of the Tetons! Plus, I also got to learn a bit, through meeting Ally's colleagues for the week (associate producers, etc) about the magic of live television, and all that goes into the makings! On Friday, the last day of competitions, I also got to enjoy the "wrap party" celebration for the end of another ESPN production of the winter X-games! Catch the party atmosphere at 3200m! France is such an amazing country! Living in Paris, it is hard to believe that the same country of Haussman architecture and La Tour Eiffel also has this dissimilar mountain culture, nestled within the alps. I loved every minute of being here. I have no doubt I will return! Your life is like a movie, I swear. I'm so happy to see you so happy!